The EUB9603H is a revolutionary High Power 11N 1T1R USB adapter with external 5dBi antenna. With the specially fine tuned RF design it is capable of deliver up to 33dBm (2000mW). 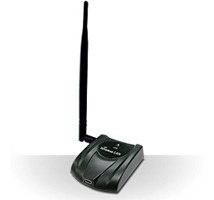 It is fully forward compatible with 802.11 b/g standard and support pre-N technology. This model is capable of achieving 3 times faster performance than G generation products. It features full coverage of wireless security including WEP 64/128, WPA and WPA2 and supports TKIP and AES encryption.